Medium - $39.99 Only 2 left! What would you do if your little dude grew up uninterested in football? We hope you'd be supportive of his passion for debate or theater or interpretive dance, if it comes to that, but if you are interested in steering him in another direction, we might have a thing or two for you. Here's a hint: it's green and gold. Here's another: you wear it. 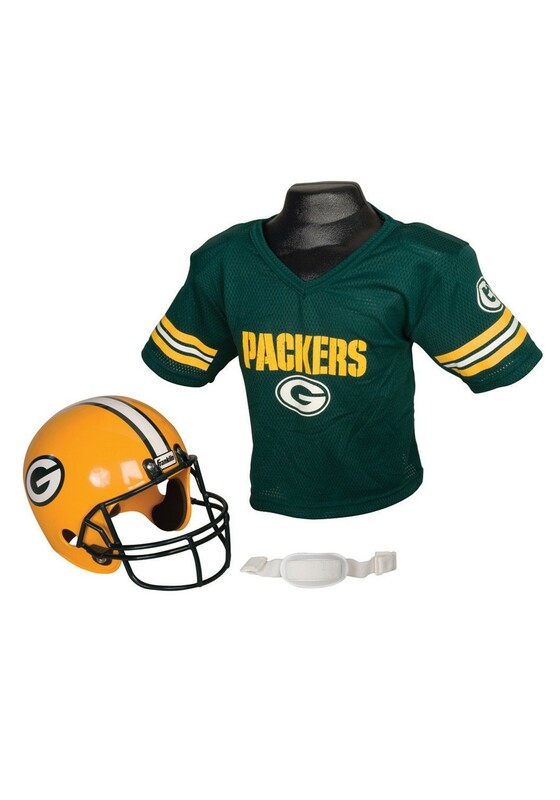 That's right, our officially licensed Child NFL Green Bay Packers Helmet and Jersey Set will have little guys all over your abode yelling "go Pack, go!" and dividing the home into a field, sides, and endzones. If you're a diehard fan of the green and gold, maybe he'll let you play too! Suit him up for duty on the frozen tundra with this fun NFL set. He might be a few years from doing a Lambeau leap, but he can still have a blast in this set!